Two thieves hit the jackpot, getting away with $3,500 cash from an art gallery near Clark and Oakdale this evening. 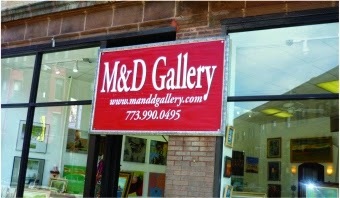 Police were called to the M & D Gallery, 2933 N. Clark, after two offenders entered the store, took the employee's wallet from her purse, and then fled around 5:30PM. The man who took the wallet is described as black 6'1" tall, with short hair. He wore a gray sweatsuit. He was in the company of a black female who wore a black baseball-type hat with gold metal decorations and dark pants. They were last seen heading south on Clark Street toward Diversey. Recorded as a theft in CPD case HX251089. A woman was awakened around 5:30 Sunday morning by an unknown male who made it inside her apartment near Waveland and Wilton in Wrigleyville. Another person managed to follow the intruder to the Addison Red Line station, where police took the 30-year-old into custody. • 800 block of Roscoe. Saturday morning. • 3200 block of Clark. Saturday.